Follow this guide to replace the InFocus 35 projector lamp. Resist the lure of cheaper counterfeit projector lamps since you put your InFocus IN35 projector in jeopardy. Your projector is equipped with sophisticated optics that need the right projector lamp. When you purchase an authentic projector lamp, you’re guaranteed a lamp that has been manufactured with high quality parts. Lower priced counterfeit lamps are made with inferior parts that can give you a lower quality light and poor image. They may end up costing you more and can also release carcinogenic materials such as Krypton 95 that are used as substitutes by copy-cat manufacturers. Buy from a legitimate source to keep your projector under warranty and protect your health. Be sure to install an authentic OEM InFocus IN35 projector lamp. A projector image that is progressively darker or with distorted colors indicate it’s time to replace the InFocus IN35 projector lamp. As the projector lamps is reaching end of life, you’ll see a warning message appear on screen that says REPLACE THE LAMP. The projector lamp will also begin flashing red. Replace the InFocus IN35 projector lamp immediately. 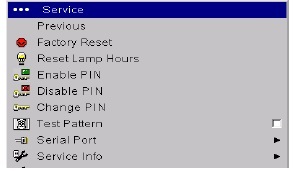 Check the remaining lamp time left using the Service Menus, Total Lamp Hours option. 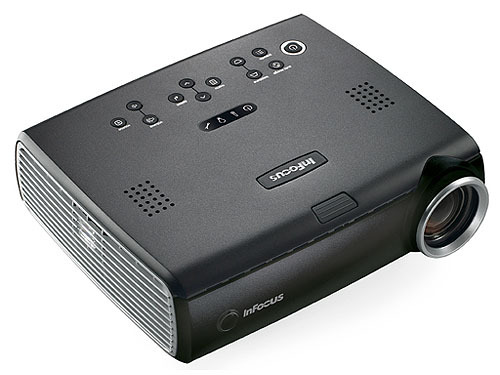 Turn off the InFocus IN35 projector and unplug the power cord. To avoid getting burned, let the projector fully cool before changing the lamp. Place the projector on a soft surface. Do not operate the projectors while any of the lamps are removed as this may result in malfunctions, fire hazard and other accidents. Caution: Don’t touch the screen or the actual bulb with your finger since the oil from your skin can cause a black spot on the bulb. 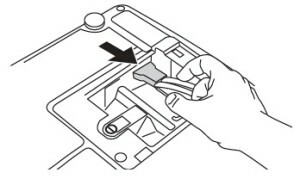 Remove the lamp door by using a screw driver to gently pop off the cover. Slide the door forward and lift the door off. Using the screw driver to loosen the screw holding the InFocus SP-LAMP-019 in place. Disconnect the connector attaching the InFocus SP-LAMP-019 to the InFocus IN35 projector. 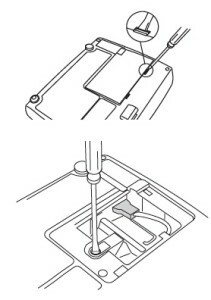 Grab the InFocus SP-LAMP-019 lamp handle and carefully lift the lamp cage up.Pulling too quickly can cause the bulb to shatter. Learn what to do should the bulb break. Install the new InFocus SP-LAMP-019 lamp housing and tighten the screw. Slide the lamp door back in place, making sure it is aligned so it clicks into place. You are ready to reset the lamp hours. NOTE: The InFocus SP-LAMP-019 contains mercury and should not be thrown into regular garbage. Recycle your used lamps! 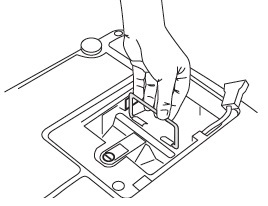 After replacing the InFocus SP-LAMP-019 projector lamp be sure to reset the lamp hours. Failure to do so will mean your InFocus IN35 will NOT TURN ON. Scroll down to the SERVICE menu. Scroll down to RESET LAMP HOURS. Lamp hours will be reset to zero. Turn off the InFocus IN35 and let it stand for at least one hour ever 24 hours.